By dislodging every attempt for progressive green legislation from very early on in his presidency, George Bush is proclaiming his disregard for the environment and open support for expanding energy supplies. He is making no attempt to balance the two. He is also proving to be a poor role model for other world leaders who are keen to save the earth. The greens are being pushed to declare a holy war against him and it is no wonder that he is being called "the worst president for the environment, since Ronald Reagan." 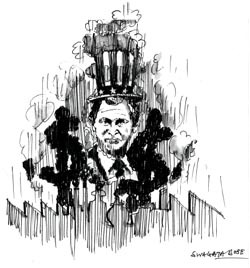 President George W Bush is willing to poison the earth with greenhouse gases and arsenic. He is clearly an oil and gas person (as The Washington Post columnist Mary McGrory mockingly labels him) with little patience for anything else. Carbon dioxide in the air, oil spills in the white, pristine tundra, arsenic in water, mining debris and nuclear wastes left unattended, asphalt roads invading forests and the extinction of rare flora and fauna for lack of habitat leave him and his aides unperturbed. His agenda is aptly described by his official spokesperson Ari Fleischer, "The President believes that high energy consumption is an American way of life, and that it should be the goal of policy makers to protect the American way of life. The American way of life is a blessed one." In February this year, the arithmetic arguments of 600 climate scientists of the Intergovermental Panel on Climate Change ( ipcc ) shook the world with its calculations on climate change and dire warnings of its fall-outs. Detailing the travails of a hotter world, the 1,000-page report underlines that future changes will be twice as severe as revealed five years ago. Predictions range from worldwide deaths due to erratic and extreme weather, increase in respiratory and vector-borne diseases, crop failures, water wars, displacement of millions by floods to increase in wildfires. Facing stiff opposition from coal and oil lobbies, President Bush, however, chose to reverse on his campaign pledge on March 13 and said he would not seek reductions in the carbon dioxide emissions from the nations' power plants. Quoting a recent study of the Energy Department, he argues that restrictions in carbon dioxide emissions would result in a shift from coal to natural gas and lead to higher energy costs. And maintained no economic discomforts for the United States. The result: the Kyoto Protocol signed in 1997 to bind industrialised countries to cut their emissions of greenhouses gases fell into disarray. The greens are predictably outraged and harshly critical of his lack of position on global warming. Is he rejecting the entire Rio process or just the Kyoto Protocol is the topmost question in their mind. In a bid to calm them, the Bush administration has promised to come up with alternatives to the Kyoto Protocol before the fresh round of international climate talks in July. It is also set to sign the Stockholm Convention on Persistent Organic Pollutants to reduce the release of dangerous chemicals and curb the use of 12 chemicals. But the greens are not to be so easily assuaged. Their ire is now directed at Bush's brand new energy policy, planned and executed without the participation of environment groups but with the active aid of oil and gas lobbies. Philip E Clapp, president, National Environmental Trust ( net ), a nongovernment organisation that critically appraises the government's green policies, angrily retorts, "When you go behind closed doors and write the nation's energy policy with industrial lobbyists what you get is a plan that benefits corporations, not consumers." net has released a comprehensive report just prior to the plan release called America and Energy in 2001 -- What government and industry data really show debunks Bush's claim of an 'energy crisis in America'. The report states that following a period of some of the lowest energy prices in history, the United States was hit with three major energy problems last year -- a rapid escalation in gasoline prices, a record spike in natural gas prices and a crisis in California's electricity market that plunged it into darkness. As long as the United States remains dependent on oil as its primary fuel, American consumers will remain hostage to world market fluctuations. Real energy independence is only achievable through energy policy that reduces fossil fuel dependence and investments in renewable energy. But Bush has authorised cuts in funds for solar energy research by 54 per cent and wind, geothermal and hydroelectric power by 48 per cent. Unlike oil prices, natural gas prices by residential consumers are largely determined by domestic market conditions and distribution costs. For 15 years, domestic natural gas prices have been in decline, largely due to excellent drilling technology. But increasing demand (due to hectic home construction and new natural gas-fired electricity generating facilities) drove prices up in the year 2000. The market responded and drilling rigs climbed from 360 in 1999 to 879 in 2001. The consumers will, however, not feel their effects till much later. The problem, the report reveals, is not that the us is running short of natural gas and needs to explore for more but that it needs to produce more from the existing reserves. Many national environmental groups have united under a coalition and are releasing fact sheets similar to the net report. Some are planning to issue counter proposals to the energy plan. They are especially enraged with the administration's plan to open up more than 200 km of the pristine anwr for petroleum exploration with claims of drilling technologies being 'environment friendly' with 'zero discharge'. They plan to fight all the way to resist invasion of "America's Serengeti". They are also alarmed by the President's plan, which if approved by the Congress, will shift responsibility for enforcing federal environmental protection laws from the epa to the states. Though the states would be provided us $25 million in grants and another us $25 million for environmental assessments under the plan, Bush proposes cuts in environment and Interior Department's programmes by us $10 million resulting in a nine per cent reduction in the epa 's enforcement staff in Washington and regional offices. This would weaken the enforcement capabilities of the epa and there is also the danger of arbitrarily no enforcement by states. The Bush government is now poised to compromise with the Roadless Area Conservation Rule protecting 58.5 million acres of underdeveloped national forests. Passed by the us Forest Service on January 5, 2001 after an extensive public rule involving more than 600 public hearings and 1.6 million comments, it lays down that logging and other development would be limited in all roadless areas in national forests. The new plan would, on the other hand, give final say over protection of these areas to individual us Forest Service supervisors. Hammering the final nail in the green coffin, the Bush administration is asking Congress to block expenditure in the next fiscal year to carry out court orders requiring listing of endangered species or designations of habitat to protect them. Activists have over the years been moving the court to demarcate habitat designations and have been so successful that last fall the Clinton government had to suspend new listings because complying with the existing orders ate up all the funds. The Bush proposal seeks to block the citizen's ability to force action through the courts. The fate of 38 species to be immediately listed as endangered hangs in balance and the position of 236 species that are candidates for federal protection is dismal. Ironically, this was exactly the situation that the Nixon government was hoping to prevent when it framed the Endangered Species Act in 1973, one of the most stringent biodiversity laws in history.